ABC is ready for fun and games this summer. This week, the network announced the premiere dates for new seasons of Celebrity Family Feud, The $100,000 Pyramid, and To Tell the Truth. Season four of Celebrity Family Feud (June 10th at 8 p.m. ET/PT) will feature appearances from Kanye West, Kim Kardashian, Steph Curry, Chris Paul, Ice-T, Tori Spelling, the cast of Grey’s Anatomy, and Vivica A. Fox. Meanwhile, the third season of The $100,000 Pyramid launches on June 10th at 9 p.m. ET/PT, followed by the season three debut of To Tell the Truth at 10 p.m. ET/PT. 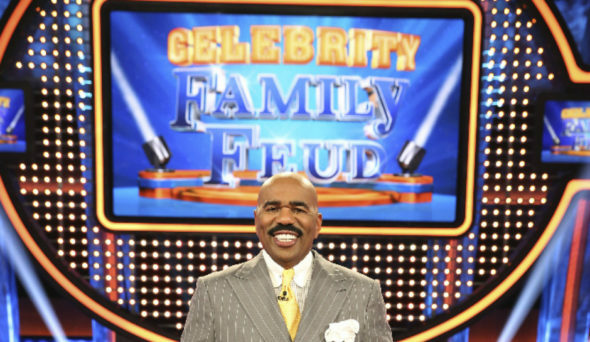 Three of America’s favorite game shows are back when ABC’s “Fun & Games” featuring “Celebrity Family Feud,” “The $100,000 Pyramid” and “To Tell the Truth” return SUNDAY, JUNE 10 (8:00-11:00 p.m. EDT), on The ABC Television Network, streaming and on demand. What do you think? Are you a fan of ABC’s game shows? Will you watch any this summer? More about: ABC TV shows: canceled or renewed?, Celebrity Family Feud (2015), Celebrity Family Feud (2015): canceled or renewed?, The $100000 Pyramid (2016), The $100000 Pyramid (2016): canceled or renewed?, To Tell the Truth (2016), To Tell the Truth (2016): canceled or renewed? I will probably watch all of them, but Family Feud is my fav!